Saturday Aug 24, 2019, the York County Corvette Club will be hosting a 7 Sanction NCCC Judged show. Register a vehicle for the 2018 Corvettes at Carlisle NCCC Judged Show. Includes weekend admission for two people. To qualify for the 10% Gate-N-Go pre-registration discount and have your entry window sticker mailed to you, please pre-register prior to July 22nd, 2019 at midnight EST. Price at the gate will be $80.00. To register for the NCCC Show Field, please click here. For Safety reasons – Corvettes WILL NOT be permitted to leave the NCCC Field until all judging is complete and all ties are broken. NO EXCEPTIONS!! Anyone breaking this policy will be disqualified from all judging and no refunds will be given. You will be dismissed by a member of the judging team. 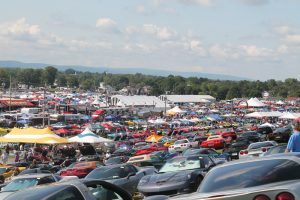 Space on the NCCC Concours show field is limited to 175 Corvettes. 2018 NCCC Show Field Winners! Congratulations and great job to all! !